This makes interesting watching. It probably needs to be taken in the context of such data as Paul Collier adduces in his excellent books The Bottom Billion and Wars, Guns and Votes, but Nye deserves to be heard in the points he makes rather more dispassionately than some of those who have commented on his video at YouTube. Without aid, cumulatively the countries of the bottom billion would have become much poorer than they are today. Aid has been a holding operation preventing things from falling apart. . . . . The statistical evidence generally suggests that aid is subject to what is called ‘diminishing returns.’ . . . The first million dollar is more productive than the second, and so on. This period is an important Centenary Celebration for the Bahá’í community of these islands. Having spent four weeks in England in 1911, ‘Abdu’l-Bahá had returned to Egypt, where He had established His residence, before embarking on an eight-month journey through North America. Greatly to the joy of the Bahá’ís in the British Isles His return journey in 1912 brought Him back to these shores on 13 December to renew and reinforce the relationship He had built with them during His first visit. He left the here on 21 January 1913. 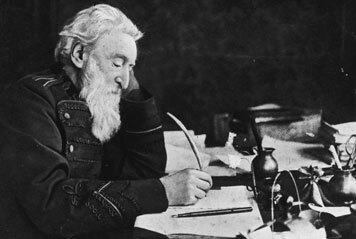 Interestingly 2012 is the anniversary of the death of General William Booth, the founder of the Salvation Army. On Christmas night ‘Abdu’l-Bahá visited the poor of the Salvation Army Shelter, Westminster, where each year a Christmas dinner is provided for those who have no homes and no friends, and but for the shelter would have no lodgings. There were about 1,000 present on this occasion. It was a most impressive scene—the dinner for the homeless and the Master from the East delivering Christ’s message to the poor. As a true test of attention, many of the hungry men forgot to eat and listened intently. “Consider his Holiness Christ: He appeared in the world as one of the poor. He was born of a lowly family; all the apostles of Christ were of humble birth and His followers were of the very poorest of the community. This is what Christ states in the Gospels. ‘It is easier for a camel to go through the eye of a needle than for a rich man to enter into the Kingdom of God.’… It is easy for the poor, very easy for them to enter into the Kingdom of God… If wealth were a necessity, Christ would have wished it for himself. He lived a simple life, and one of the titles of Baha’o’llah was ‘the poor one.’ In Persian His title was ‘darvish’ and that means one who has not a slave. “All the prophets of God were poor, His Holiness Moses was a mere shepherd. This will show you that in the estimation of God, poverty is greater than the accumulation of wealth—that the poor are more acceptable than the lazy rich. A rich man who spends his wealth for the poor is praiseworthy. Consider that the poor are not born in a state of solvency: they are not tyrannous. All the tyranny and injustice in this world comes from accumulation. The poor have ever been humble and lowly; their hearts are tender. The rich are not so. At the close of his talk, ‘Abdu’l-Bahá…left twenty golden sovereigns and many handfuls of silver with Colonel Spencer of the Army, so that the poor might enjoy a similar dinner New Year’s night. Colonel Spencer told the men that they were to have this New Year’s dinner in ‘Abdu’l-Bahá’s honor. The Master was just leaving the hall when this announcement was made. With one accord the men jumped up and waving their knives and forks gave a rousing farewell cheer. There is an interesting piece on the following link (Baha’i International Community message delivered at this year’s United Nations Commission on Social Development) which provides a more satisfying perspective on poverty than can be found in the usual slogans: for the full story see link. Initiatives to address poverty should give attention to strengthening the moral, ethical and spiritual capacities of individuals and communities. That was among the messages delivered by the Baha’i International Community and other non-governmental organizations at this year’s United Nations Commission on Social Development. “Efforts to eradicate poverty must be guided by a vision of human prosperity in the fullest sense of the term – a dynamic coherence between the material and spiritual dimensions of human life,” said May Akale, a representative of the Baha’i International Community, in an oral statement to the Commission on Monday 14 February. “Poverty, as has often been stated, is not merely the lack of material resources, but also the absence of those ethical and social resources that create an environment in which individuals, through social institutions and communities, can develop to their fullest capacity,” said Ms. Akale. Read the full oral statement delivered at the UN Commission on Social Development (PDF).